Also known as Grizzly Bear Town, Koona (Skedans) on Haida Gwaii was home to almost 1,000 Haida prior to the middle of the 19th century. Skedans aka Koona as photographed in 1897 by C.F. Newcombe -- from "Those Born at Koona"
Carpenter John Smyly built a precise model of q’una (Koona) which has remained on view at the RBCM ever since its completion. 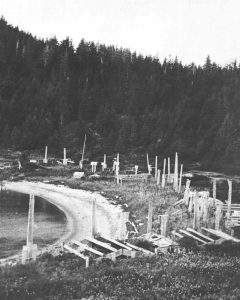 In 1957, John Smyly (1924-2002) was hired as carpenter by the Provincial Museum of British Columbia (now the Royal BC Museum) to accompany the museum’s expedition to Haida Gwaii (Queen Charlotte Islands) to record and remove totem poles that were in need of conservation and preservation. Smyly later built a precise model of one of those villages, q’una (Koona), which has remained on view at the RBCM ever since its completion. John began model-making as a hobby in his early teens and developed it into a fine art all the rest of his life. He worked in shipyards and the aircraft industry during the War, and went on to wood-working in various factories around Victoria. His model-making skills, coupled with his fascination with First Nations art and architecture, led him to employment at the Provincial Museum from 1965 to 1988. 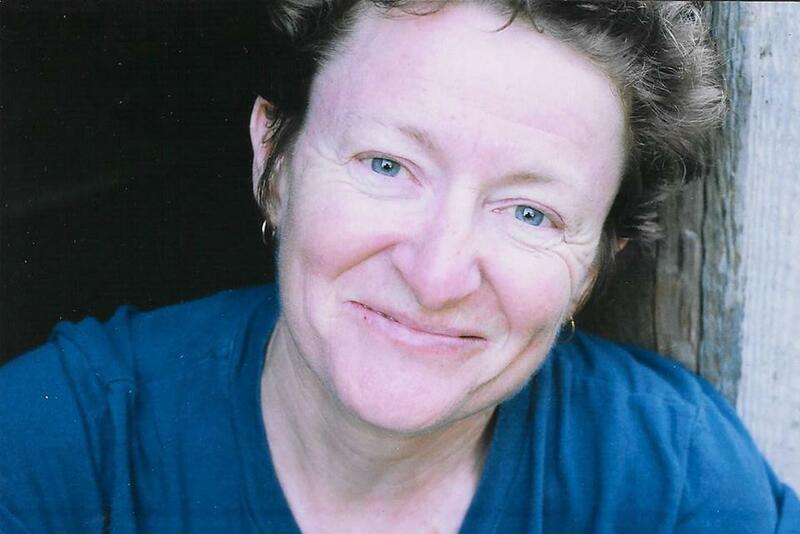 The nature of John Smyly’s collaboration with Carolyn Smyly is explained in his original acknowledgements. 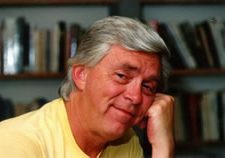 “I should like to express my gratitude to my wife, Carolyn, who convinced me that I should try to write a book about the village I had been studying for so long and who offered to tackle my notes, research the printed works, and type the results.” – Ed. 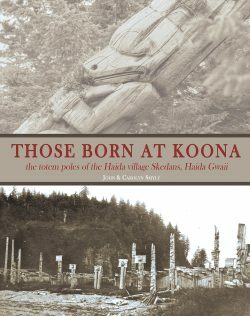 Those Born At Koona was originally published by Hancock House Publishers in 1973 as a hardcover and then released two years later by the University of Washington Press as a soft cover edition under a different title, The Totem Poles Of Skedans. The seeming inconsistency in titles is readily explained by the fact that Skedans came to be the popular name of q’una or Koona among non-Indigenous researchers in the 1970s. Those Born A Koona is a result of two undertakings: the salvage and restoration of totem poles at coastal villages in British Columbia that began on Haida Gwaii in 1953, and John Smyly’s 1956 commission to “… produce three Haida houses and representative group of poles in miniature,” for display at the British Columbia Provincial Museum of Natural History and Anthropology (BCPM, now the Royal British Columbia Museum). This new reprint remains a compelling read for anyone with an interest in Haida architecture and monumental carving. 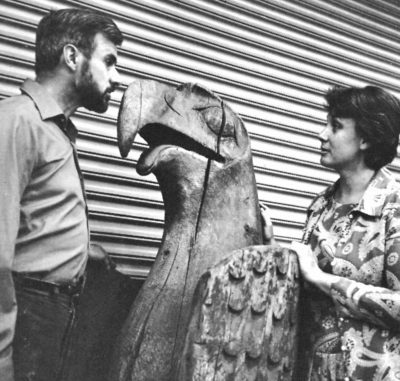 In 1954 the BCPM, the University of British Columbia, and the Indian Affairs Branch formed a Totem Pole Preservation Committee to co-ordinate totem pole salvage and restoration projects in B.C. That year, permission to purchase and remove six poles from t’anuu ‘llnagaay (Tanoo) and q’una ‘llnagaay (Skedans) was obtained from the Indigenous owners. Three poles were transported to the BCPM and three to UBC. 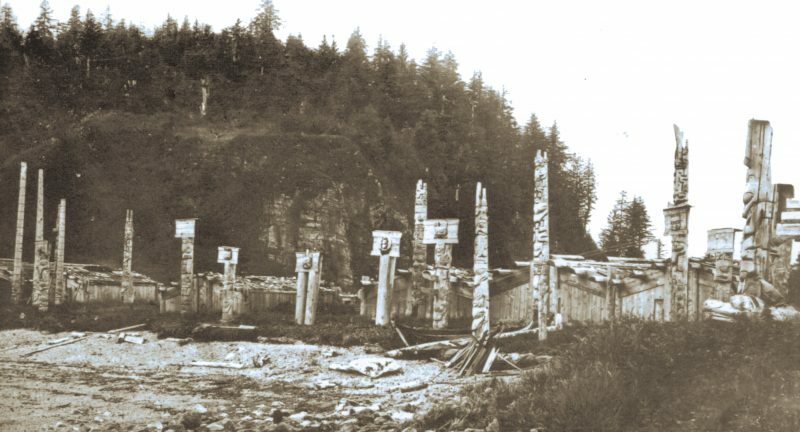 Working primarily from the earliest extant photographs of Haida Gwaii made by George Dawson, a field geologist with the Geological Survey of Canada in 1878, Smyly produced a precise model of q’una. He first used a magnifying glass and then a jeweller’s eyepiece to reveal the crest figures, size of the poles, and memorials. He then sketched and subsequently carved miniatures of 24 of the 27 dwellings, and of 54 of the 56 monumental carvings that constitute the village model. Since the museum’s opening of the First Peoples Gallery in 1977, Smyly’s model continues as a featured, stand-alone display unit. 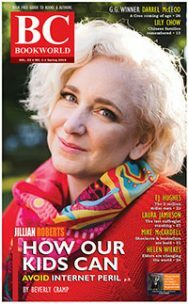 I encourage readers to take the book with them should they visit the Royal BC Museum. Those Born at Koona is well footnoted and the listed references are more than adequate for the 1973 edition. Included are four of the earliest and most significant ethnographic works on the Haida: The Haida Indians of Queen Charlotte Islands by J.G. Swan (1874); Contributions to the Ethnology of the Haida by J.R. Swanton (1905); Report on the Queen Charlotte Islands by G.M. Dawson (1880); and the Manuscript Notebook 1897, by C.F. Newcombe. 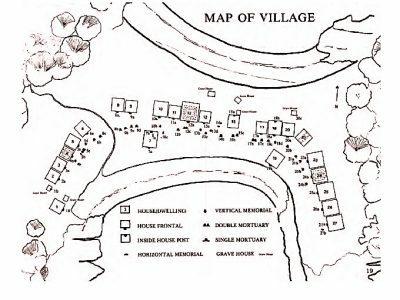 A detailed map of the village appears on p. 19 and again on p. 120 for ease of reference while reading or consulting the text. The houses and monumental carvings are numbered so that their locations in the village are easily found. An accompanying key identifies the house type (dwelling or grave); type of pole (house frontal, inside house post, vertical memorial); mortuaries (single or double); and finally, horizontal memorial. A reference list of Eagle and Raven crests, some of which are drawn, can be found on p. 25. The text associated with each house and pole proceeds methodically from west to east through the village. Smyly’s passion for, and appreciation of, the art form of Haida monumental carvings and house architecture is evident in the finely detailed line drawings that appear generously throughout the book. A section of a house frontal pole (p. 37) and the eagle and cormorant inside house post (p. 81) are but two fine examples. All 24 houses are described and their house names provided, when known. The two types of Haida houses, the more prolific six-beam and less common two-beam, are briefly described (p. 102), but unfortunately, as front views, the sketched examples do not show the interior positioning of house beams, support columns, corner posts, or split plank roof boards. A cutaway drawing with some of the external construction elements removed to reveal the house interiors would have been helpful. Smyly presents a brief photographic history of the village beginning with the 1878 Dawson images and carrying through to the late 1960s. Readers should note that the photographs used to document the cutting down, crating, and moving the poles to the water’s edge for transport south (pp. 32 and 33), were taken during a subsequent salvage undertaking to sran gwaay (also known as Ninstints and located on Anthony Island) in 1957, not at q’una. Unfortunately, some of the black and white field photographs that appear in the reprint are not of equal quality as those in the original edition. Also missing are captions indicating date and authorship for some of the in situ photographs. Neither of these shortcomings, however, seriously detracts from the overall research value of the book. The epilogue concludes with two of John Smyly’s diary entries reflecting on the brief side trip made to q’una in 1957 during the sran gwaay expedition where John served as carpenter. 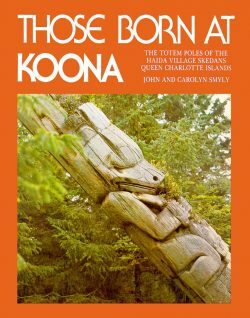 These entries are significant because they foreshadow the sequel to Those Born At Koona, namely Saving The Silent Ones: The 1957 Totem Pole Salvage Expedition To Ninstints, World Heritage Site (Trafford, 2008), also by John and Carolyn Smyly. Intended as a companion volume, Saving The Silent Ones is a “… very personal account, taken from [John’s] diary … water-stained notebooks … photographs, watercolour sketches and pen and ink drawings” of the 1957 totem pole salvage expedition. For reasons explained in the book it was not published until 2008. In conclusion, there is little to complain about with this book. As stated, not all the field photographs are dated; the example of a two-beam house (p. 102), supposedly to be found in the George Dawson photograph (p. 87), in fact appears in the Charles Newcombe photograph (p. 105). On rare occasions the language is dated and reflects the era in which it was published: “Indian informants” rather than Indigenous consultants. The upper photograph on the cover is reversed from its position in the 1973 version. Like so many timeless books, Those Born At Koona has weathered the test of relevancy. Dan Savard worked at the Royal BC Museum for 37 years with the anthropology audiovisual collections and has given many public lectures on the interaction of Indigenous Peoples and photography. 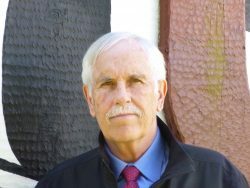 In 2010 he won second place in the British Columbia Historical Federation historical writing competition and the following year won the 2011 Roderick Haig-Brown BC Book Prize for his book Images from the Likeness House (Royal BC Museum, 2010). 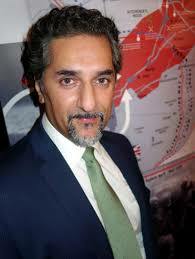 In 2017 he was the recipient of the Canadian Historical Association’s British Columbia Clio Lifetime Achievement Prize.